I’m sitting in the Heathrow airport, on my long journey back from Vegas to Kuwait (where I’m temporarily working on a project outside of Afghanistan). It was such a whirlwind week that I’m not sure I can properly sum it up, but I’ll give it a go before race amnesia sets in! I came into this race a bit of a multi-stage ultrarunning veteran. 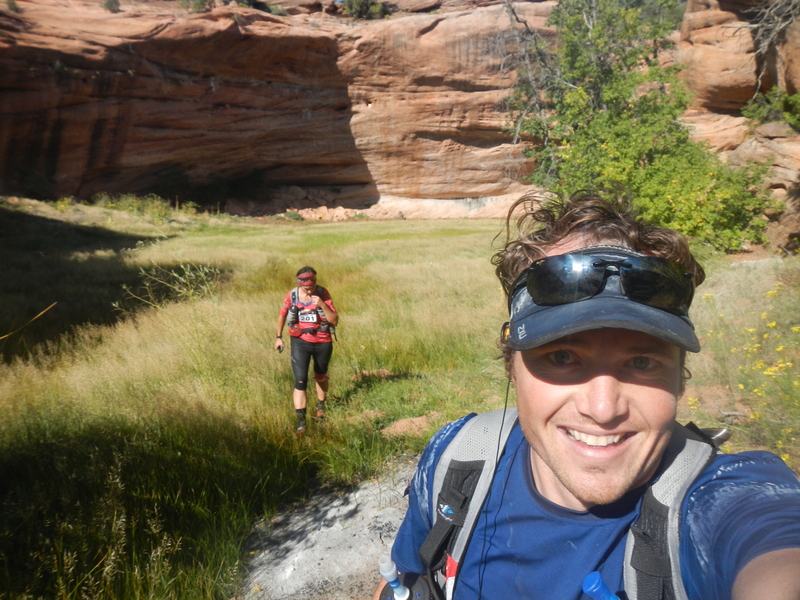 It was my sixth 250 km self-supported footrace and I thought, hey, what surprises can there possibly be? 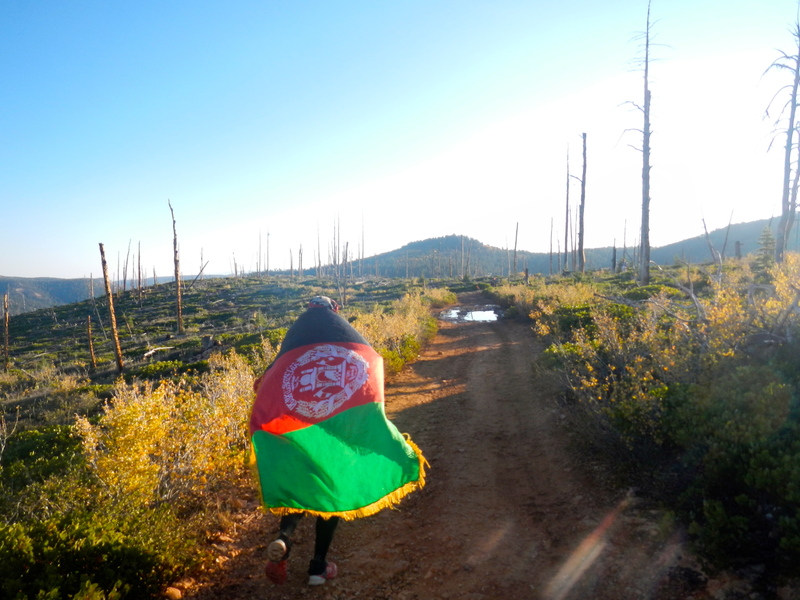 I had done this distance and this race format before, and in some of the most remote locations on earth: northern Vietnam (2008), the Namibian desert (2009), Australian outback (2010), Annapurna foothills in Nepal (2011), and the Gobi desert in China (2012). I knew that the G2G ultra would be fun, but hey, I was only in the United States, so how exotic could it really be?? I have to say, I was extremely pleasantly surprised at (a) the diversity of the scenery and the course, (b) the difficulty of the race and (c) the level of organization, especially as the G2G was the inaugural event. For all of you ultrarunners and budding ultrarunners who are contemplating entering this race next year, I’ll elaborate a bit on each of these! 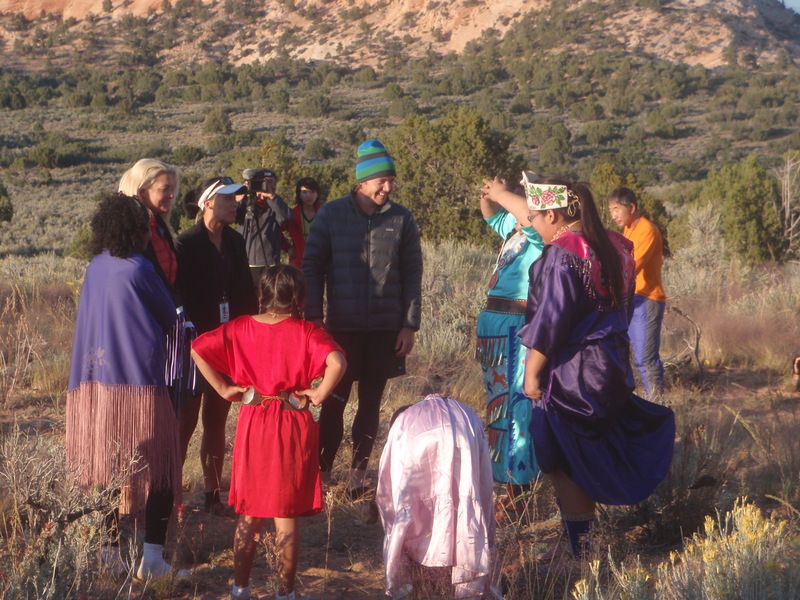 The G2G is the first multi-day self-supported footrace to be held in North America. 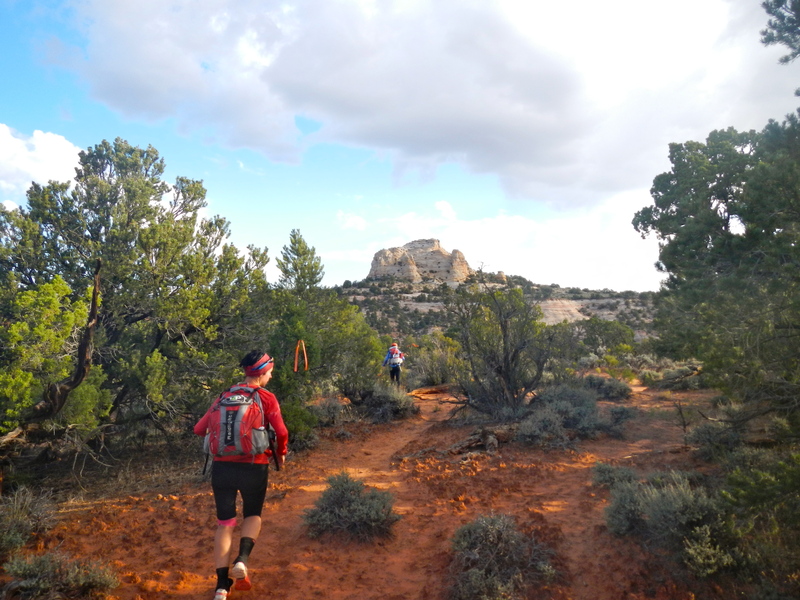 Sure, there is the TransRockies, which is a multi-day trail running event in Colorado… but it isn’t self-supported. Having to carry your own pack, including food, during a multi-day race is a huge part of the game, so this made the G2G truly unique in North America. 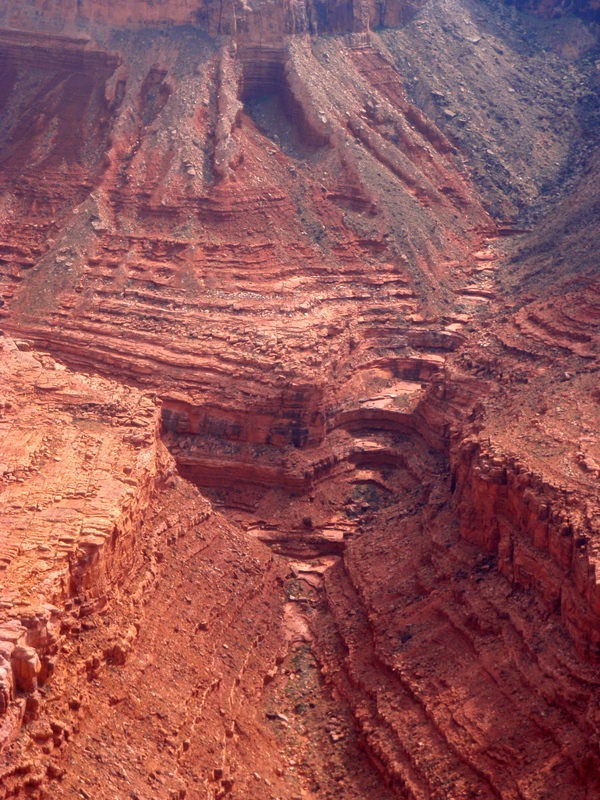 Now, again, I knew the Grand Canyon would be beautiful at the beginning of the course and the Grand Staircase would probably be stunning at the end (hence, Grand to Grand…), but I didn’t have high expectations for all of the stages in between. In my experience, when races are structured around major landmarks or attractions, the rest of the course might actually be really boring by comparison, simply because of logistics. However, G2G is anything but boring. I actually couldn’t believe how much variety there was in the course, in addition to the major attractions that they advertised. 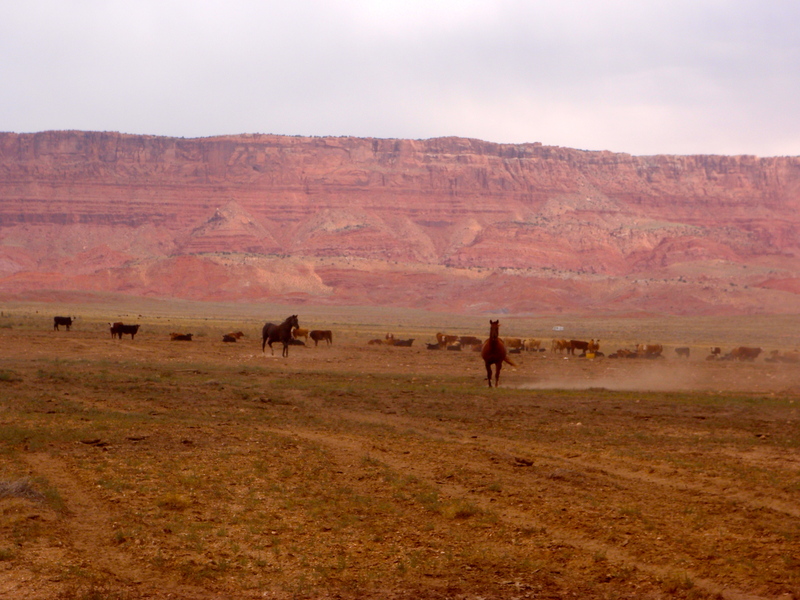 Stage one started at the North Rim of the Grand Canyon, and while it was mostly flat dirt road for 50 km, we had incredible views of red cliffs and escarpments and wide open plains. 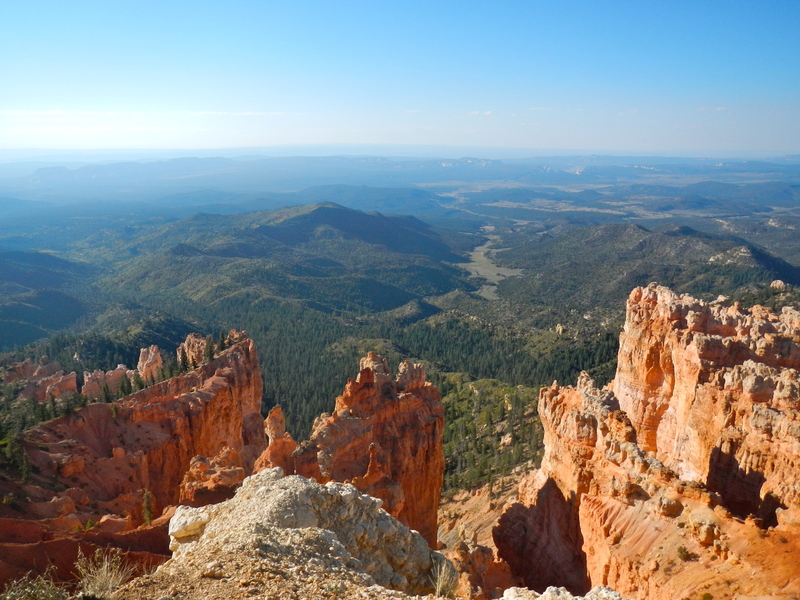 View from the North Rim of the Grand Canyon – the race start! It definitely suited runners versus climbers, but the view was stunning enough to distract the mind from the burning sensation in the legs! Stage two started off fairly quickly with a steep climb, which provided a bit of a break on the ‘running legs’. 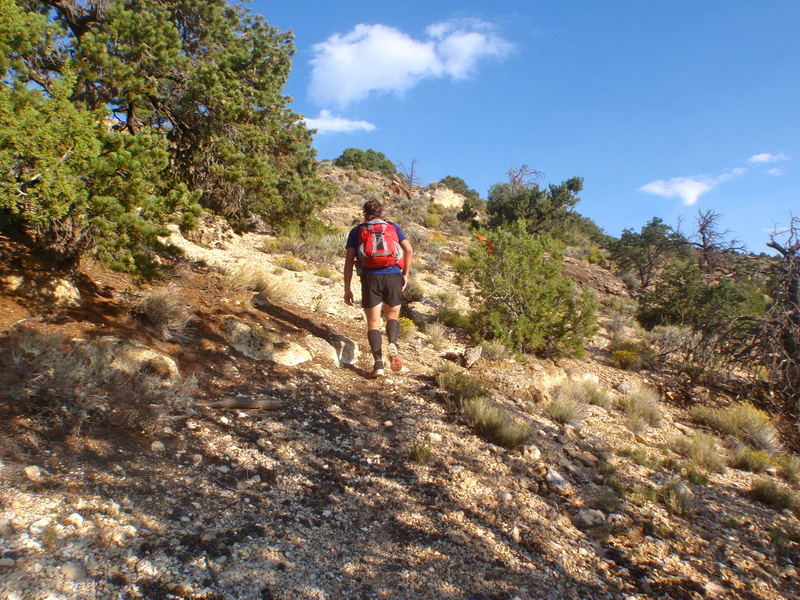 It was then followed by some single- and double-track trail through forested areas and back to running across scrubby open fields. Again, the variety really helped keep the legs fresh because we were constantly switching up muscle groups. Stage three was the long day, which is pretty unique. In Marathon des Sables and all of the RacingThePlanet events, the “long day” (which is usually twice the length of all of the other days – a double rather than a single marathon) is normally on Stage 5, which means that the race is pretty much over after that point. Sure, it is physically harder to run 80 km at the end of a race, rather than in the middle, as your legs are already extremely fatigued. However, mentally, I would say that it is MUCH harder to run 80 km right in the middle of the race when you know that you still have more than a couple marathons left to go. You can’t really “leave it all out on the course” like you otherwise might because there is still a good chunk of race left to finish! That being said, I really enjoyed the challenge of a long stage on day 3. Our packs were heavier than we were used to (again, because we hadn’t eaten as much food out of our pack as we otherwise would have had the stage been two days later). But it wasn’t as bad as I feared. We had a staggered start – the top 10-15 or so started about an hour after the rest of us slower folk, which really helped spread out the field. We took a short (15 min) truck ride to the start line, which was right at the base of a beautiful rocky climb upwards to scrubby plateau and then a sandy ATV track, which rolled up and down over the next couple of checkpoints. Now, I must admit, this was the day when I started experiencing extreme bum chafing at about the 30 km mark, so things are a bit fuzzy for the rest of the day…. but I remember thinking that I was pleased about undulating track, brief sections on road (to rest the calves), spongy reprieves through grassy valleys, and challenges of sandy paths. Speaking of sand…. when there was around 20 or 25 km to go in the 78 km course, we came up on the sand dune section. It was incredible. What made things REALLY neat was that we had the same views of expansive sandy hills, rolling out one after the other into the horizon, that you could get in remote locations in Africa or the middle east, except it was right in North America. Sure, the dunes weren’t as high or imposing as the ones in Namibia and it wasn’t nearly as hot as the sandy tracks I ran along in the Australian outback. But this did not take away from the challenge. Stuart and I hit the 5-6 km sand dune section right before sunset, so we got to see the sandy piles change from beige to pink to dark orange and finally to black… It was tough going, especially on the achilles, calves and the feet, but also added a certain element of exoticism to the course. Despite my grumbling, I did actually enjoy this section, if not for dramatic effect. (Note to future racers: make sure you have sand gaiters, not only for this section but for the rest of the race! Stuart and I only had “rock gaiters”, meaning that the fabric only covered the ankle, rather than the whole shoe. 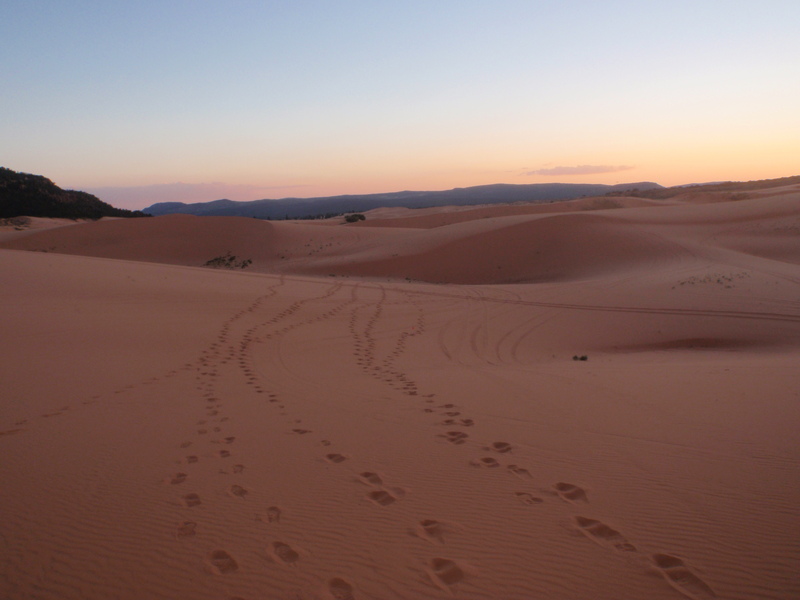 As a result, we had to stop every 5 km or so on the sandy rack, and every 2 km across the dunes, to dump the growing sand piles out from inside our shoes…). Stuart and I finished the long day at around 11:30 pm at night, which meant that we had the whole next day to rest our weary bones. 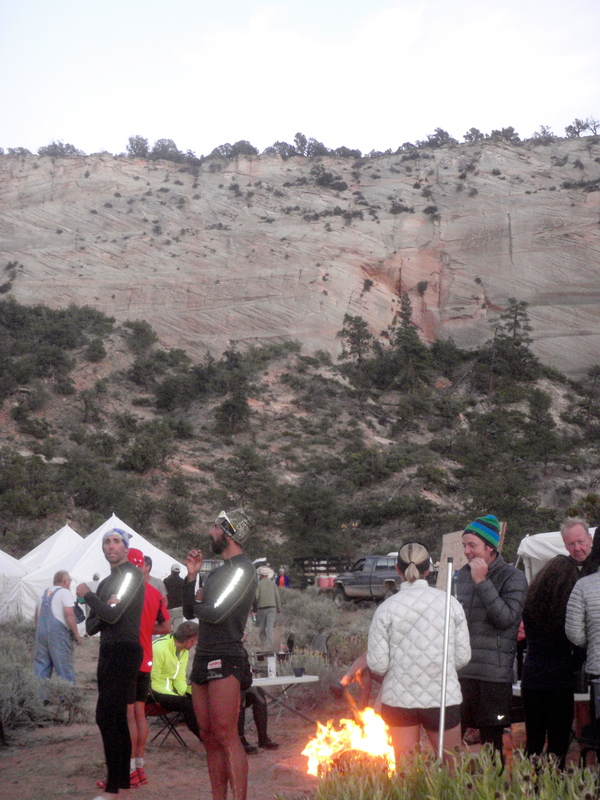 The camp was set up at a beautiful vantage point, high up on a hill against a rock face with a view of Zion national park. We happily rested in the ‘social’ tent, which camp manager Dan Stake had set up perfectly for eating, emailing, and generally chilling out. Near the end of the day, Tess and Colin Geddes treated us with not one, but TWO amazing surprises: a cooler full of cold sodas, followed by some traditional song and dance by the locals!! Stuart getting dragged into the fun – dancing is a great way to loosen the muscles! Stage four (day five) was finally “just” a marathon distance. Although there were some pretty sights along the way, I think we had been so spoiled with the previous days that I found this stage a little bit monotonous. 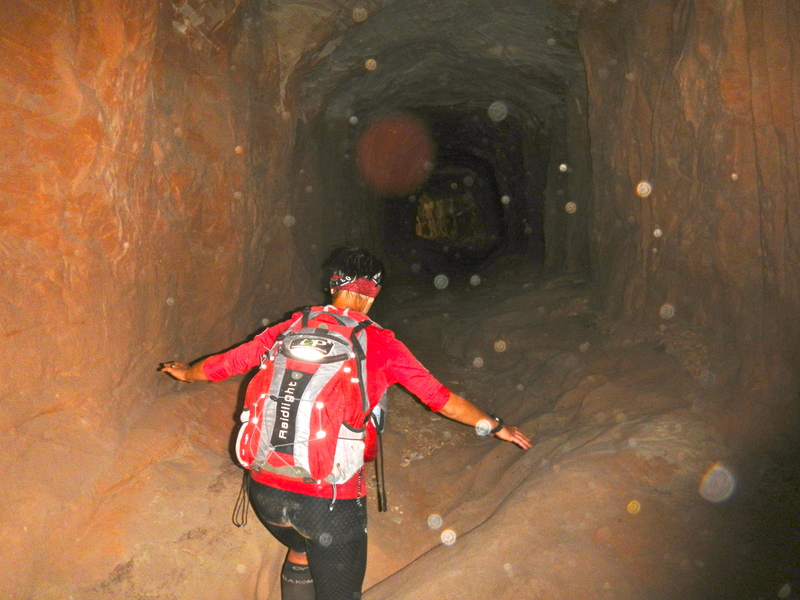 That being said, looking back, there were actually some kind of cool sections, including a part when we had to run through a dark tunnel…. 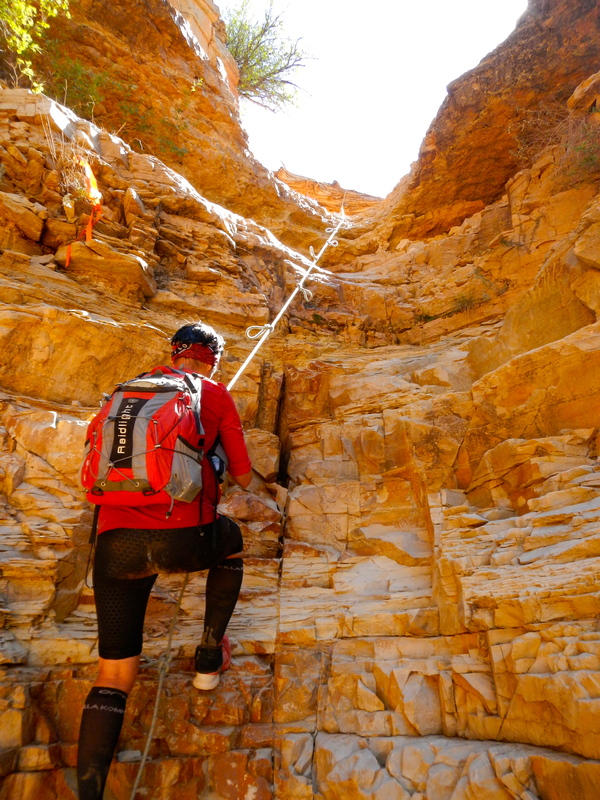 …and then scale a rock face using a single rope…. Stage five (day six) seemed like a really tough slog, but I’m not sure if that was because of all of the mileage we had covered by that point or because of the course. It wasn’t particularly tough, but the day just dragged on for some reason. 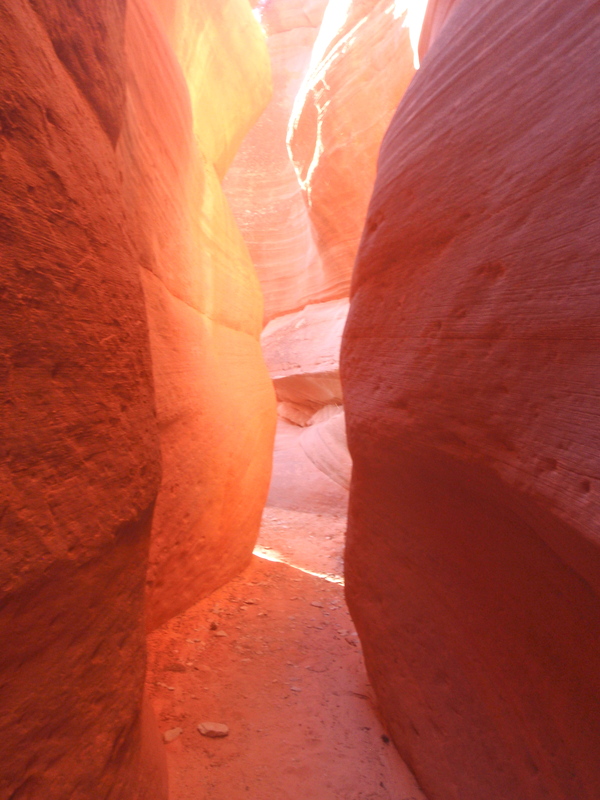 It started off brilliantly with a sandy run through the pinky-orange slot canyons, which some have compared to the Kingdom of Petra in Jordan. For a few good miles, Stuart and I weaved our way along a narrow sandy track nestled in between two glowing vertical rock faces, which changed colour depending on where the sun shone in. What an experience. Humorously, there were so many race photographers and media personnel stationed throughout the canyon on this part of the course that running through it gave me a sense of what it might be like to be a celebrity (er, minus the scrapped knees and bum chafing – pretty sure Angelina hasn’t had to deal with that yet). At every corner there was a new photo opportunity and a different member of the race paparazzi. I’m pretty sure Stuart and I ruined every photo that was taken as we were constantly stuffing our cheeks with candies and chocolate, taking photos of our own, or generally readjusting our chafed body parts (awesome). Looking forward to seeing what develops, ha! At long last, we reached the final stage, day seven. Now, normally the final stage of a multi-day race is pretty uneventful and fairly boring. The day is more about the ceremony of “finishing” rather than actually experiencing a proper stage. However, this is where the G2G shone again. The last stage, all 9 miles of it, was simply STUNNING. For the last day, the competitors were split into three staggered starts: 6 am, 7 am and 8 am. Stuart and I were originally put in the “fast” group at 8 am, but after a bit of convincing and displaying of my purple-possibly-broken toe, we convinced Tess and Colin to let us go in the moderately-paced 7 am group. It was an extremely cold last night at camp, so we didn’t mind the 4:30 am wake up call (note to future runners: definitely bring a sleeping bag rated to at least 0 degrees C, even if the mandatory equipment only requires 5 degrees!!). Stuart and I huddled by the campfire, nursing our last blueberry granola breakfast and trying to keep warm before heading out in the pickup trucks on our 30 min drive to the last race start line. We began running just as the sun was coming up. It was a narrow single-track trail that curved alongside a wooded mountain, dotted with barren trees and evergreens. Normally I really struggle on the last day and 9 miles is pretty long for a final stage – but I enjoyed every minute. We climbed up and up and then hit a two-track gravel road, which we followed further up into the sky. A series of hills finally brought us to the finish line, which was set against the backdrop of the land we had just crossed. All in all, it was a tough week, but definitely manageable. 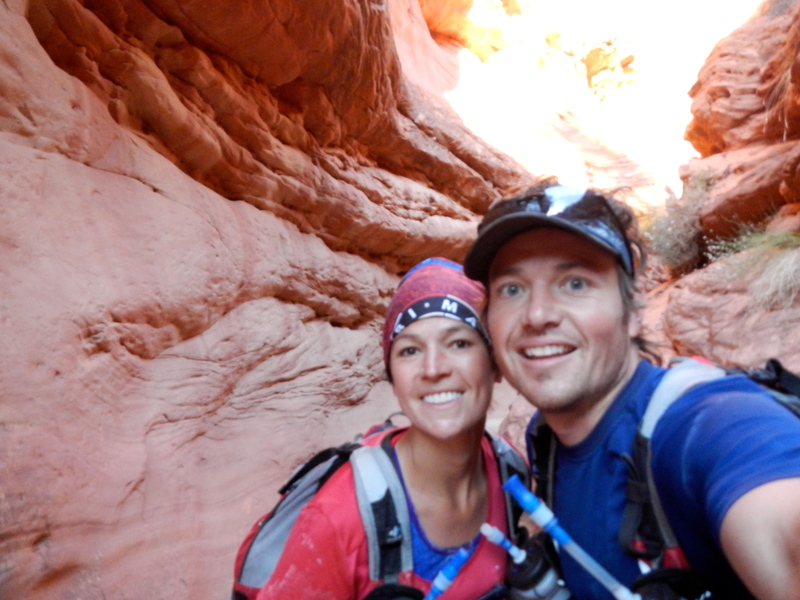 Stuart and I handicapped ourselves with dehydration episodes, falling escapades, and chafing issues…. but these problems were frankly our own fault, rather than the fault of the course. Other runners who hadn’t done as many races asked me how it compared to other multi-stage races. I would have to say that I think it falls somewhere in the middle in terms of difficulty. Definitely not as hard as most of RacingThePlanet’s roving races (Vietnam, Namibia, Australia), but much more challenging than the ones in the four desert series (Gobi) or even the Nepal roving race. The long stage was brilliant – hard enough to feel like you had just accomplished something pretty frickin’ amazing, but not so hard that you felt like you might die at some point (fine balance). In terms of this being the FIRST G2G, I can say that it was fairly well run and will only get better in the coming years. Having competed in a few of RacingThePlanet’s roving races, which are always one-offs, I have seen how hard it is to pull these races off without having any ‘test runs’ first. Things will inevitably go wrong and they won’t necessarily be as smooth as races such as Marathon des Sables, which has been running for decades on end…. but this is part of the fun. The only big complaint I would have of the race is the course markings. While the turn-offs were marked, it wasn’t too impossible to miss them (which we did, along with other very experienced runners). As mentioned in one of my previous posts, normally I would know to turn back in a race if I had gone the wrong way. The general rule is that if you don’t see a course marker for 500m or a kilometer, you TURN BACK. However, in G2G, this wasn’t the case. There were long stretches, over 2 km at some points, without course markers so there was no way to reassure yourself you were going in the right direction. Even if the course is a long a road with no turnoffs, it is so, so, so important to put down ‘confidence’ markers for this reason anyhow. Tired runners do not think logically, and it is just too tough to keep running not knowing if you are going in the right direction! 1. Gaiters: I would say that sand gaiters are a must – the kind that velcro right onto the shoe to provide a full cover around the toe and heel. You’ll survive without them, but your toes will be a lot more comfortable with them and you’ll save time by not having to stop and dump out your shoes! 2. Sleeping bag: It gets surprisingly cold at night in Utah, especially during the last couple of nights. I had a sleeping bag rated down to -1 C, whereas Stuart’s bag only went down to 5 C, and those few degrees definitely made a difference. Take the plunge and invest in a good bag – you’ll be glad you did! 3. Sunscreen: This is another item that isn’t on the mandatory equipment list, but that you might want to take anyway. I normally forgo the sunscreen if I can in order to save weight, but if I did it again I probably would have taken some. The sun is surprisingly strong in this part of the US, even at the end of September, and while I am happy with my tan, my peeling nose could probably feature on a melanoma prevention poster at the moment. Better to be safe than sorry. 4. Eating bowl/mug: In other races, I leave a bowl or mug behind in order to save weight. Instead, I cut the top off of one of the 1.5L water bottles I get given at camp, and use that as my bowl/mug for eating and drinking. G2G, however, is different – water is handed out during the race and at camp from large gallon jugs. This is much more environmentally-friendly, but it means that you have to come up with another plan for eating your meals in the evening, if you normally rely on the water bottle method. I just saved one of the packages from one of my dehydrated meals, and reused it throughout the week. This saved space and weight in my pack and seemed to do the trick. 5. Headtorch: I would recommend bringing a strong headtorch for this race. There were some quite technical/bramble bush maze parts during the night section of the long stage, and without a strong lamp to guide you when you’re tired, you could get into trouble. I have to thank Tess and Colin Geddes, and Terry as well, for putting on an incredible race… Ray Zahab for being my coach and inspiration with his organization, impossible2possible…. and Zac Addorisio of Runners United, who encouraged me and helped me enter this race. Looking forward to following the race next year and congrats to all of the other competitors. BIG thanks to my boyfriend, Stuart, for pulling me through this race and being the best partner a girl (or runner) could ask for. It was tough times, but we made it through. As my friend and fellow runner Belinda told me, sleeping bag spooning is allowed during the race, but not forking (HA!). Congratulations! What an amazing adventure!! 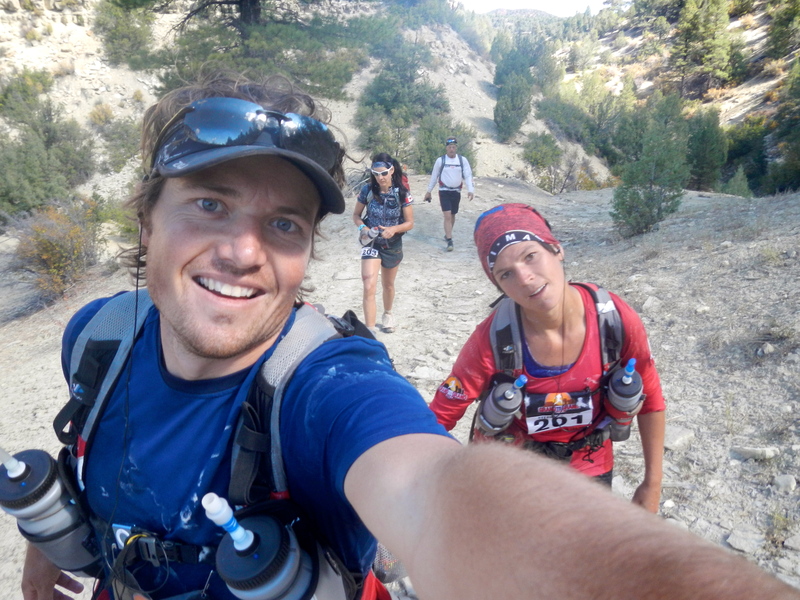 Pingback: Some of the Amazing Characters at the Grand to Grand Ultra | The Runner's Trip: Run Long, Travel Far, Discover More.